FBI Wireless Intercept and Tracking Team: Files reveal new information on Stingray, cellphone surveillance. The FBI likes to keep quiet about its surveillance methods. But a series of newly released documents shares details about the secretive tactics it uses to covertly monitor cellphones. As part of an ongoing Freedom of Information Act suit launched by civil liberties group the Electronic Privacy Information Center, the FBI is turning over information on its use of cellphone surveillance technology variously known as “Stingrays,” “Cell Site Simulators,” “IMSI Catchers,” or “Digital Analyzers.” These devices function as portable surveillance transceivers that are designed to trick phones over a targeted area into hopping onto a fake network. The FBI says it uses the tools to track the locations of individual suspects. But the technology is controversial because, by design, it collects data on innocent bystanders’ phones, and it also interferes with cellphone signals in a way that may be prohibited under a section of the federal Communications Act. Over the past year, the FBI has been drip-releasing redacted portions of a trove of documents that it holds related to the use of the Stingray technology. And late last week, the bureau turned over a batch of 500 pages featuring newly declassified portions that offer fresh insight into its spy tools, as well as shining a light on a little-known internal surveillance unit that has built up within the bureau over the past decade. 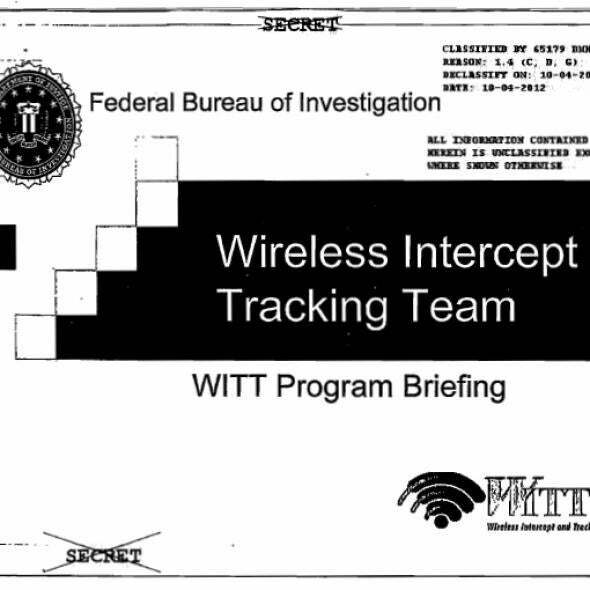 The documents show that the FBI established a specialist cellphone surveillance group called the “Wireless Intercept and Tracking Team” as far back as 2003 or 2004. The WITT is apparently made up of surveillance technology experts who maintain the FBI’s line of spy tools. The unit, according to the documents, conducts research and development, offers “24x7 operational support” to feds engaged in surveillance missions; conducts training in how to use the spy devices; and liaises between the government and companies selling the latest surveillance equipment. It also maintains an internal website that provides information and “interactive media,” presumably to keep the feds well-schooled on the latest cellphone monitoring issues. In addition, the newly released files reveal that it is not just the Stingray tool that the FBI has used to track down cellphones. In previous years, it has also deployed devices known as the “Loggerhead” and the “Triggerfish”—both made by Florida-based Harris Corp., the same company that manufactures the Stingray tool. While the Stingray is a device primarily designed to be used for tracking the location of phones, it is notable that both the Triggerfish and Loggerhead were designed to allow authorities to eavesdrop on the content of calls. The Loggerhead, however, is largely an obsolete device because it was made to spy on old analog cellphones that have been superseded by digital. The disclosures build on documents previously turned over to EPIC by the FBI, which have shown how the bureau has been deploying Stingray-style technology for about two decades and is well aware that its use of the cellphone surveillance equipment is in a contentious legal area. The FBI has acknowledged that it holds about 25,000 pages of documents that relate to the cellphone tracking equipment. To date, the bureau says it has reviewed 22,982 of those pages for release, but it has decided to keep secret 80 percent of the files—turning over 4,377 pages, many in heavily redacted form, because it says it does not want to reveal investigative methods.